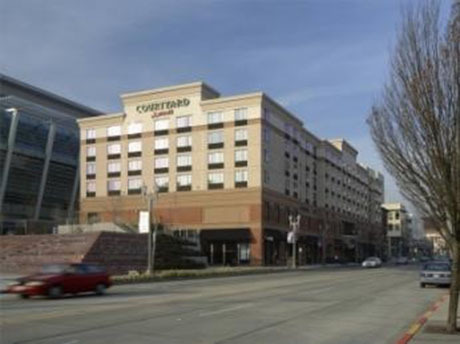 The Tacoma Marriott is a 162-unit hotel building in downtown Tacoma. There is approximately 10,000 s.f. of retail tenant space, a commercial laundry and kitchen area, as well as a swimming pool. The building was constructed incorporating an existing heritage property attached at the west elevation. The heritage component was maintained and refurbished as part of the build. The building was constructed using load bearing steel stud framing, pan deck and lightweight concrete. There is approximately 7000 square feet of conference room which is designed to be modulated into up to 4 configurations to house various events. Stateside designed all the pathways required to allow for multimedia interface and fire alarm coverage within the dynamic space. There is also a dedicated network interface under the Tacoma light rail into the adjacent Tacoma Conference Center utilizing fiber back bone as well as Click, Tacoma’s own fiber network.